Welcome to the Neighbourhood Social! Every few months we're going to iterate different versions of our not-for-profit Neighbourhood Social pop up program initiative on various sites across Melbourne with different ideas all through 2018. Our joyous little pop-up events are designed to connect you with the fellow humans of your community in a culinary choose-your-own-adventure game. If you'd also like to host in your area, let us know and we’ll set you up with a kit containing everything you need to register + launch your own. How involved you want to get is up to you : You can join an event, host your own, or help us spread the word. But it all starts with a meal. Let’s share it. We'll be engaging with the local community to co-create fun & entertainment on these nights, so if there's a song you've been working on that you want to share, a story you want to tell, or a skill you'd like to teach, our amazing collaborators and neighbours will help make the backdrop happen. You never quite know what's going to happen at the Neighbourhood Social! This is part of our not for profit Grow. Cook. Eat. Play. initiative and the events are completely free of charge. All you need to bring is a dish, big or small, from your culture to share with your neighbours. 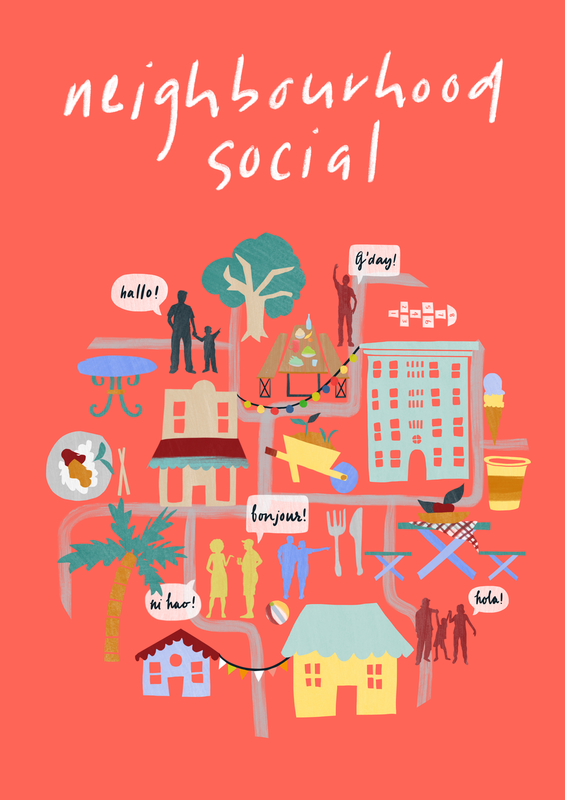 The evenings will be refreshingly phone-free, allowing neighbours young and old, from all backgrounds, to connect with each other and celebrate local diversity over the simple joy of homemade food. We also recommend tagging your dish so people know if it's gluten free / vegetarian / vegan friendly / halal. We know this is going to ignite some exciting collective conversations, and think every neighbourhood should have one! Dinners are limited to 30 seats (to keep them cosy) but there's plenty of standing room in the garden.